The Canary Islands’ latest big attraction crossed the chequered flag in first and is now signing autographs for the hordes of fans waiting outside. 01.01.2015 - If it has always been your dream to drive a Ferrari or Lamborghini, whizz around an actual racetrack, or learn how to handle a car like a race driver, then Supercar España is the place for you. Based close to the Gran Canaria Airport, Supercar has the best instructors and sexiest cars, as well as 20 years’ of experience of providing the slickest supercar service in Europe, as owner John McCrae happily explains. With 52 cars at their disposal worldwide, Supercar España has some of the best, including two very limited edition Ascari KZ1GT3 race cars. Only seven were made, at a gross cost of €50 million, and two were ‘written-off’, leaving just five of the cars, which at the time were the most advanced GT, with a full carbon chassis and an engine developed by F1 engine specialist, judd engineering. They also have a fantastically spirited Caterham CSR260 (a very lightweight car with 260 horse power that’s quicker round the track than most of the supercars), a Ferrari F1 430 (brilliant red of course! ), and a Lamborghini Murciélago LP640, the only one ever made in white of the original eight special Prindiville editions built, and which came with a whopping 700 horse power. Supercar also has a stunning Ariel Atom, famously quoted by Jeremy Clarkson on Top Gear as “Driving nirvana” after initially leaving him speechless. The Atom can reach 60mph in less than three seconds. Alongside a professional racing driver as your co-pilot, The Atom Experience is a must for any would-be Lewis Hamiltons out there. The cars mentioned above, and numerous others not listed, are currently in Gran Canaria, with more on their way, providing a constantly changing supercar service. Race tuition is available from Supercar’s expert team, including ex-F1 drivers. 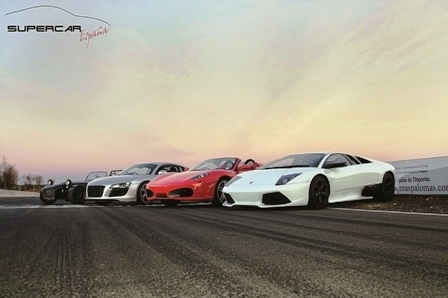 In their unique collection of supercars and GT3 race cars, they provide the highest octane driving available. You can be coached to learn the craft and technicalities of racing, with every course tailor made to your skill sets. Starting off in a BMW M3 you are tutored through the practical and theory sides and slowly work your way up to GT3 standard. Group bookings are also catered for, as are business and corporate events, even down to simple passenger rides for those who want to taste the feel of a dream car but are slightly daunted to get behind the wheel of one. Whatever you’d like to do, learn, or experience, Supercar can deliver; from fully-catered five-star hospitality down to simple personal whims. The perfect once-in-a-lifetime ‘bucket list’ experience in the Canaries! Following two successful decades providing services and corporate events in the UK, including training and hospitality for Jaguar, Supercar moved operations to Granada in Spain, and more recently, Gran Canaria, where they have been going for five months. With those 52 cars in their catalogue, the line-up of glamour vehicles is continually refreshed and the track at San Bartolomé de Tirajana is the perfect setting for accommodating them. The Circuito de Maspalomas is a 4km long track used for championships, car testing and press presentations by brands such as Lamborghini, Audi and Porsche. It runs parallel with the ocean and the runway of a small airport, so planes take off and land as you race alongside! It is also highly technical and features some tricky corners that require difficult handling. Supercar España also continue to operate at The Guadix Circuit in Granada in mainland Spain, which rests at the feet of the Sierra Nevada Mountains and is an FIA approved 3km circuit, with a great mix of fast, slow and multiple corners. It is widely regarded as one of Europe’s best tracks for training and is used by some of the most successful teams in motorsport. If you’re in a shopping centre in Gran Canaria, or fortunate enough to be holidaying in a top hotel, the chances are you may see one of Supercar’s supercars drawing huge attention. It’s proved an extremely useful marketing ploy to just let their showcase cars do all the talking and let the followers come to them! They also recently accommodated the crew of a Norwegian reality TV show to film two contestants perform challenges at the track over several days. With the backdrop, cars, circuit, staff and expertise they possess, there’s an endless list of services they can provide. So what of my own experience handling the cars and track? As probably the most unlikely person to undergo such an activity, I flew the short distance to Gran Canaria with little expectations and a little trepidation. I knew I was going to see in real-life the gleaming cars that line the walls of boys’ bedroom walls, and that I was going to take one or two of them for a spin, but I had no idea of the adrenalin-rush that was to be the Supercar España Experience! I was collected from the airport in style and taken to the track where the small team of instructors were waiting. First up was a spell in a BMW M3 E46, used as a training car to give instruction to new drivers, as well as teach courses to those more dedicated in their love for racing. My instructor for the day, Tom, took me around the track, slowly, for two laps, pointing out the markers, tough bends and technical procedures involved in making the best time going around the circuit. It wasn’t as easy as I expected; there was a hell of a lot to take in and try to remember, and you have to be totally focused to manoeuvre the track proficiently enough so as not to draw the wrath of your instructor - who will push you hard! Tom then took the car round three times at speed, telling me what he was doing and why, before it was my turn to jump in the driver’s seat. For 12 laps I forced myself to improve on the last, which was no difficult feat based on my initial clumsy attempts, but after half a dozen laps I had stopped over-thinking and felt a flow. The changing procedures when approaching tight corners were happening more fluidly and I was really disappointed when I was pulled in on my last lap after losing myself in the moment during the last few circuits. In my adrenalin-fuelled brain overfilling with fantasy, it felt like a new video game that I was only just starting to get the hang of! Next up I was offered three laps in a supercar and given the choice of the Ferrari or the Lamborghini Murciélago LP640 Prindiville Edition. If I had to choose one special car that always made me dreamy-eyed, it would be a Lamborghini. Growing up in the 80’s, images of the Countach were everywhere. The upward-opening scissor doors epitomised the glamour-tinged style of the decade, and I spent many a homework session in my bedroom idly dreaming of getting behind the wheel of one. And now I could! Tom lifted the scissor door and started the motor - it let out the roar of an angel. I asked if I could start the engine and he smiled as he handed me the key. I then approached the Lamborghini as if it were my car; unlocking the driver’s side after a busy day on the set of a new blockbuster movie, lifting the cool-as-ever scissor door with a flourish, and sliding onto the leather driver’s seat with as much panache as I could muster. It was much lower than expected, and incrediby, luxuriously comfortable. I pretended that I wasn’t pleasantly surprised; after all, this was my car and I was on my way home to my seafront villa for a Martini! I composed myself and started the engine. That roar again. I smiled and drove her onto the track, where for three laps I was simply lost in another time, another place. I remember returning to the parking area and handing the key over. I probably gazed longingly for several minutes as I slowly edged away. I’d just fulfilled one of my fantasies, and the rush speeding through me told me I liked it! I wanted more! And I was treated to it in spades. I was fortunate enough to be present when current Gran Canaria Drifting Champion, Ayoze, was practising and he offered to take me for a spin – literally! Drifting is a driving technique similar to stunt driving, where the driver intentionally over-steers, locks the wheels and uses the hand brake at speed to dramatic effect, all the way maintaining control of the specially adapted vehicle. Drifting, like Tuning, is very popular in the Canaries and Supercar’s operation in the south of Gran Canaria is a welcome addition for local enthusiasts. Despite the scary screeching of tyres, burning rubber and jolting skidding, it wasn’t nearly as frightening as it looks, and was tremendously exhilarating. But the Caterham CSR260, for me, was a slightly intimidating experience. Following my taste of Drifting, Tom took me out for three laps in the race car as a passenger, and the lightweight vehicle reaches speeds that leave your stomach some way behind the rest of your body. The deafening noise and the breathtaking accelerating and decelerating of such a powerful vehicle is really not for the faint-hearted but, oh, what an adventure! The Supercar Experience is something not to be missed. It’s a private circuit so you don’t need a driving licence with you, and residents receive a discount. Contact them on (+34) 922 786 027 or 607 801 326. Visit their website, www.supercarespana.com or email: info@supercarespana.es. You can also search for Supercar España on YouTube for videos and information. They currently have a special offer of 14 laps in a BMW M3 training car, three laps in a supercar (Ferrari, Lamborghini, etc.) and three ‘hot laps’ in a racing car for only €200! So if you live around the corner, are over on holiday, or visiting from a sister island, get yourself down to Circuito de Maspalomas and be James Bond for the day!